Issue #13--Fall 2007. 28 pages. 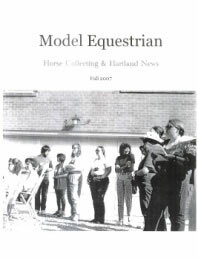 Includes tributes to John Henry, Marguerite Henry, and Marney Walerius; model horse and Hartland news and history; practical tips and abstract ideas. This publication has the personal feel and "small" topics of a hobby magazine, yet addresses "larger" issues. Its purpose is to inform and uplift! Issue #12--Summer 2007. 24 pages. Issue #11--Spring 2007. 24 pages. Issue #10--July-August 2006. 20 pages. News, features, and advertising, including two pages in color! Issue #9--November-December 2005. 24 pages. Model showing in Europe; custom artists alter Marx and Hartland models, and say how! Issue #8--January-February 2005. 24 pages. 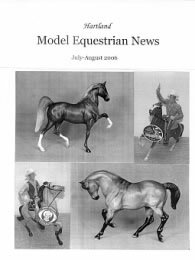 Fun for horse lovers, model horse, Hartland, Breyer, and Stone collectors, with book and movie reviews, equine art where you least expect it, and several other brands of 3-D horse likenesses. Issue #7--November-December 2004. 28 pages. Features the opening of ten, 1960s rider sets, new in box and an 1983 article in which I interviewed and photographed two prominent riders, one of whom competed for the U.S. in the 2004 Olympics. 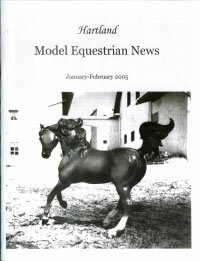 Contents cover 2002 to mid-2004 Hartland models, with light coverage of other brands, and some horse lover's news. 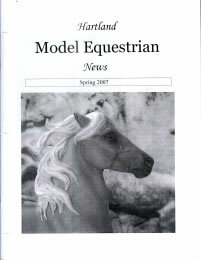 With 28 pages, there is too much to try to describe in a few words, but let's just say it includes a very special equine art offer related to Hartland, articles by collectors and artists, model horse book reviews, captivating show reports, shelving advice, news of several brands of model horses (not just Hartland), advertisements of models wanted or for sale, and more. Issues #1-4 are now combined into one magazine with 36 pages and index. 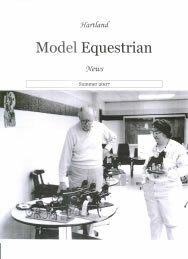 Model News--Hartland eBay store, Breyer specials, other inside tips; Hartland specials in June and July; shows with Silver Sultan; a comprehensive list of the 2001 Hartland models; and opening General Lee after 40 years (photo essay). This newsletter includes many things not published at this web site or anywhere else! Buy it and see. Hartland pinto TWH; T-shirts by artist Summer Frost; five, surprise Hartlands sold at Jamboree; three Hartland resins planned; other Hartlands at Jamboree; "Tom-Tom" and "Silver Sultan"; shows that plan to offer Silver Sultan; BreyerFest and Equilocity; special Stone, Breyer, and Hartland models at June events; letters and pictures from collectors; heat caution; book about "Walter" the Hartland model; Model Horse News & Comments (a page full). 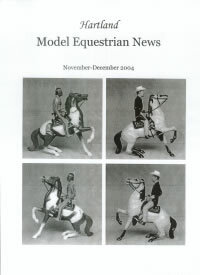 Models rival real horses at Midwest Horse Fair; Peter Stone signs models; Opal, the blue Stone Arabian; High Standards makes model jumps; life-sized resin horses; first Hartland model of the new century arrives (polo pony); Nylint Corp. reorganizing debts; new Hartland models benefit from pearl white; artist Ann Reynolds sells custom Hartlands on eBay; Mustang lamps not by Hartland; column starts in Horsing Around; model from Great Lakes Congress honors author Marguerite Henry; book reviews: books on tack, resins, and Hagen-Renaker. 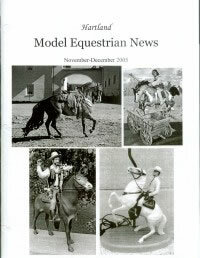 Hartland Models to Return; 2001 Breyers; Barbara Zoulek, model horse customizer, retoucher, and vehicle maker; Driving West magazine; Nylint and other brands of model horses and toy horses; Breyers in 2000 Christmas catalogs; horse-themed calendars. Watch for more updates to purchase. All are helpful and fun. Find them on the Catalog page and on the Order Form..